Ai Weiwei‘s Forge is single show across both of Mary Boone Gallery’s Fifth Avenue and Chelsea locations, with installation, video and sculpture that provides a comprehensive look into recent work, and which runs concurrently with his exhibition at the Hirshhorn Museum. 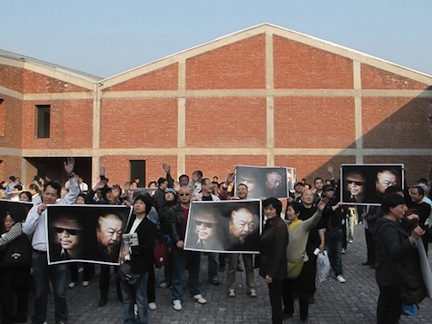 Ai is an artist, human rights activist, and Chinese dissident who produces thoughtfully provocative, political work. Forge falls firmly in that tradition. Ai was born in Beijing in 1957 and attended the Beijing Film academy before moving to New York in 1981. He graduated from Parsons School of Design in 1983 and returned to China in 1993, where he currently lives. Though his website and blog have been brutally censored, Ai remains active on Twitter, and video transmissions from him are frequently released, including a recent take on ‘Gangnam Style’ in which he dances, waving around handcuffs. 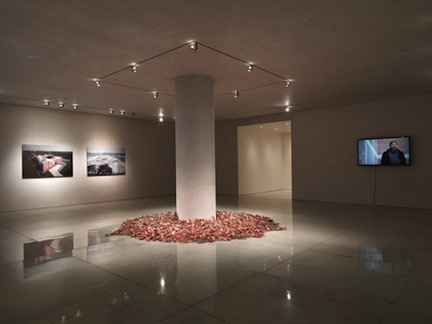 The exhibition at Fifth Avenue includes 2,500 hand-made porcelain river crabs surrounding the room’s center column. Screens on the wall play a documentary film about the 2011 destruction of Ai’s studio, and pre- and post-destruction photos are also on display. 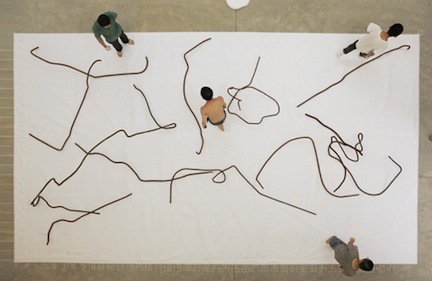 He Xie, the work’s title and the Chinese word for river crab, sounds like the Chinese word for “harmony,” which is used as a euphemism for the Chinese government’s widespread, thorough censorship, especially on the web. As with all Ai’s works, the story and political context is just as important, if not more relevant, than the objects themselves. In this case, He Xie stems from a dinner party Ai arranged in 2010, but the story begins in 2008, when the mayor of Jiading (a northern district of Shanghai) invited Ai to build a studio space that would provide a cultural center for the city. The government promised to provide all the proper permits and support the studio’s construction, but soon after the building was completed in 2010, the same government pledged to demolish Ai’s newly built studio. 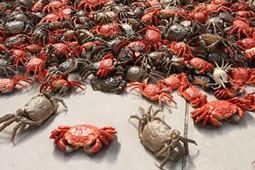 In response, Ai invited friends and supporters via Twitter to gather in his studio’s courtyard for a feast of 10,000 river crabs; literally, a feast on the false “harmony” the government offered. Ai was placed under house arrest and couldn’t attend the feast, but it went on without him. In January 2011, the studio was razed. 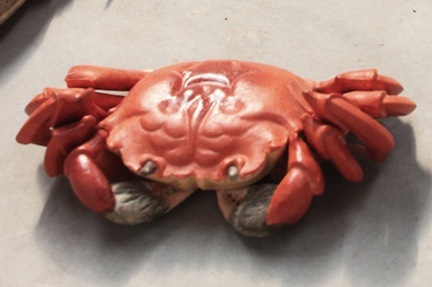 A similar collection of river crabs is on view at theHirshhorn (until February 2013), at which point the entire show, According to What?, will travel to the Indianapolis Museum of Art in April 2013 and then to the Brooklyn Museum for an exhibition beginning in April 2014. 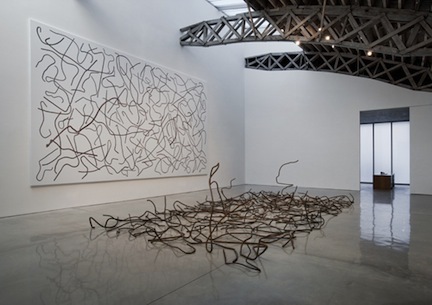 At the second Mary Boone location in Chelsea, writhing steel rebar is placed on the floor in a carefully planned pattern, which is mirrored by a photograph on the wall of the same rebar. 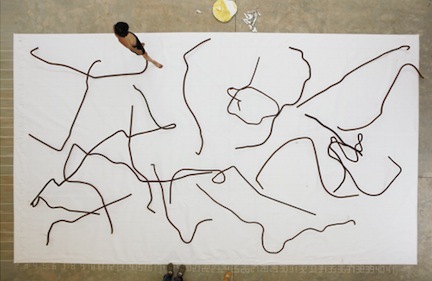 A documentary of the installation process is also showing. 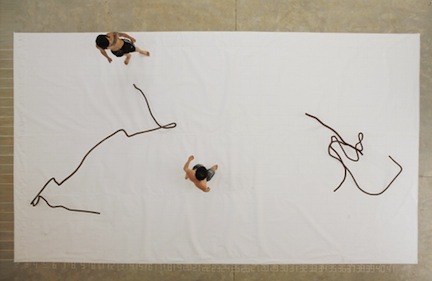 The effect of twisting, dancing rebar is engaging, even fun – until you hear the political context. On May 12th, 2008, a magnitude eight earthquake decimated Sichuan, China. Many buildings remained intact, but in a now-familiar refrain from news from China, several buildings were built quickly, with poor planning and materials. Those buildings happened to be schools, and over 5,000 students were killed as a result. Ai began an investigation into the construction and subsequent cover-up of the disaster. He published the names of all the victims on his blog (which has been censored), and began work on several projects that highlight the government’s missteps and encourages the rest of the world not to forget the victims. An installation of 9,000 backpacks, Remembering, covered the façade of Haus der Kunst, Munich from October 2009 to January 2010. The backpacks spelled out the words, “She lived happily for seven years in this world,” which is a quotation from a mother whose child died in the earthquake. The words flew across the Internet, creating a sensation and causing the sort of awareness Ai is famous for. In almost all of Ai’s works, repetition is a way to help viewers understand the impact of the politics involved. Repetition is also a form of memorization, and perhaps it is Ai’s way of disseminating the message. 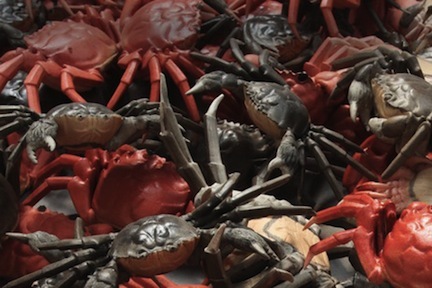 In Sunflower Seeds, Ai’s previous exhibition at Mary Boone, millions of sunflower seeds were placed on the floor; 9,000 backpacks were hung in Munich; now thousands of crabs litter the floor. 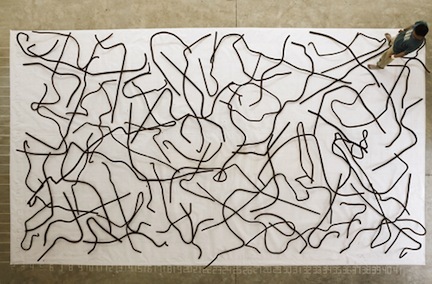 The exhibition is on view at both the Fifth Avenue and Chelsea locations through December 21st, 2012. 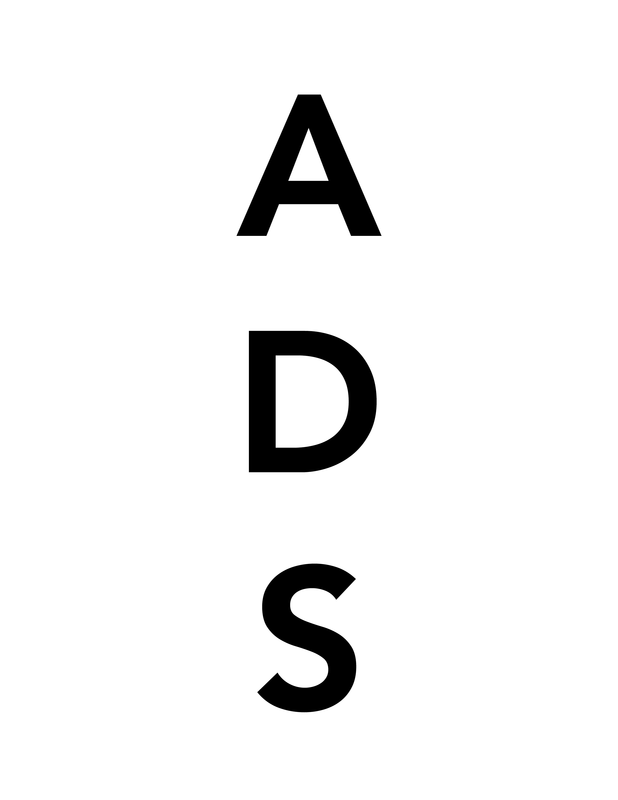 This entry was posted on Friday, December 7th, 2012 at 12:18 pm	and is filed under Art News, Go See. You can follow any responses to this entry through the RSS 2.0 feed. You can leave a response, or trackback from your own site.